The benefits of having an engaged campus community is a topic that comes up often in higher ed, but what about the students who don't engage? What are the real consequences that arise with a student who is disconnected from his or her campus? What Causes Students to Disconnect? Summer Melt - Students who apply and get accepted to college or university get overwhelmed or confused by the amount of information and work needed to navigate other enrollment requirements, and consequently never show up. Financial Struggles - Some students can’t afford tuition, and don’t know where to turn to for assistance, so they drop out. Anxiety - Students often get overwhelmed with what is expected of them in this new environment, and simply decided to leave. This is most common in first generation students, as they don’t have parents who can help them navigate the complexities of higher education, having never attended themselves. While these factors seem very different from one another, we can attribute a lack of student engagement as an underlying cause for all three. Had students who suffered from summer melt, financial struggles, or anxiety been able to locate and access campus resources in a timely manner, with minimal difficulty, chances are they might have stayed. By having information regarding counsellors, financial aid, student services, or even access peer to peer support at any time of day, on or off campus, students would be more likely to persist. As previously discussed, the biggest consequence to students feeling disconnected is attrition. But what does that mean for the institution? In a past webinar we discussed the average cost of attrition for 4 year private schools ($8.3M), 4 year public schools ($13.3M), and the cumulative per year cost to 2 year institutions ($950M). Upon seeing these sobering figures, it becomes clear that letting disconnected students fall through the cracks is not sustainable in any sense of higher education. A study done at Cedar Crest College found that students only spend 20% of their time in a classroom while on campus. This is why director of the Student Union and Engagement, Lauren Condon, found it imperative to find an effective way to communicate with students outside of the classroom. 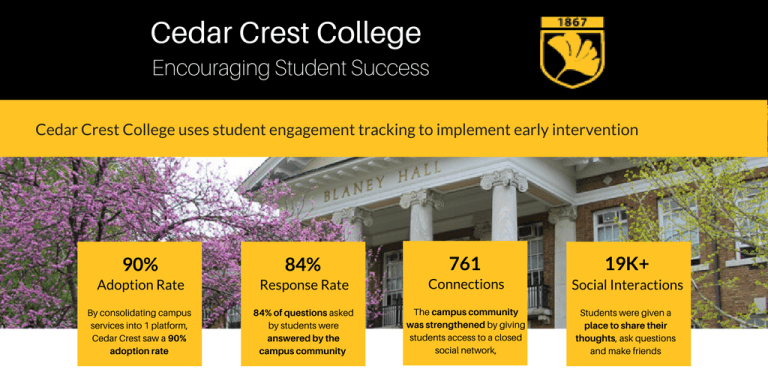 Before adopting a platform that allowed administrators and staff to connect with students on campus, Cedar Crest found it difficult to get students engaged, to attend events, and to collect useful data. They relied on complex surveys across multiple departments which often led to disaggregated information. However, once making the decision to adopt a mobile student engagement platform, Cedar Crest was able to establish a 98% response rate when assessing 42 services offered on campus, allowing for a better overall student-experience. With a 90% adoption rate, the ability to track disengaged students, and the option to interact and encourage these students to connect with their campus, Cedar Crest College is creating a supportive environment where student persistence can flourish. With 97% of Gen-Z and Millennials owning smartphones, meeting students where they are: on mobile, has the potential to create the biggest positive impact in terms of student engagement, with the least amount of routine disruption. In 2012, 32% of students reported using their mobile device for learning purposes. In 2016 however, this number jumped to an impressive 69%. With students becoming increasingly open to using their smartphones as a tool within their campus experience, it would be nothing short of a mistake to disregard this game-changing method of communication and student engagement. With so much going on across all departments within an institution, it can be difficult to identify at-risk students, as well as take positive action to help them succeed. While technology can never replace the need for human interaction, it has the ability to become an invaluable tool for not only administrators and staff, but students as well.